The Robert N. McClelland Lectureship was established in 1990 by the Chief Residents to honor all the surgical faculty, past, present and future, for their excellence in teaching. The teaching faculty of the Department of Surgery at the University of Texas Southwestern Medical Center is recognized as a key component to the success of the surgical residency program at Parkland Memorial Hospital and the University affiliated hospitals. 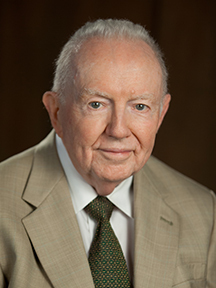 The annual lecture is named for Robert N. McClelland, M.D., Professor Emeritus of Surgery. Dr. McClelland was the first faculty member to hold the Alvin Baldwin, Jr. Chair in Surgery, an endowment designated for support of surgical education. He has received more than 16 other awards over his long career — most of them related to teaching. His influence as a medical educator extends beyond UT Southwestern into surgical training programs throughout the country. He originated, edited and published the Selected Readings in General Surgery, a reading program for residents in general surgery used across the U.S. Prior to his retirement, he transferred this program to the American College of Surgeons where it still continues. 2000 Bruce L. Gewertz, M.D. - “What Academic Medicine Needs To Do To Survive and Why Should I Care? 2007 Karen R. Borman, M.D - "Wanted: A Healthcare Policy Mantra for Surgeons"